FIRST QUARTER GROSS OUTPUT AND B2B DATA: RECESSION AHEAD? Washington, DC (Thursday, July 23, 2015): Gross Output, a broader measure of U. S. economic activity published by the Bureau of Economic Analysis, continued to slow into the 1st quarter of 2015, confirming tepid growth in the economy and a potential recession. According to today’s BEA release, real GO advanced at an annualized rate of only 0.7% to $31.0 trillion by the first quarter of 2015, compared to 5.2% in the 3rd quarter and 2.6% in the fourth quarter of 2014. The downward trend in the economy continues. In nominal terms, GO actually fell 1.1% but price deflation was so strong that GO increased in real terms. Gross Output (GO) is a measure of sales or receipts of all industries throughout the production process, including business to business transactions (B2B). Most B2B activity is left out of GDP statistics. Since the financial crisis of 2008-09, GO has risen faster than GDP, and that continued to be the case in the 1st quarter 2015. Real GO rose slightly compared to a small loss in real GDP in the 1st quarter. Gross Domestic Product (GDP), which measures the value of final goods and services only, fell 0.2% in real terms to $17.7 trillion in the fourth quarter. The fact that GO is still growing faster than GDP suggests that the economic recovery is still in place, but only marginally. B2B activity actually declined significantly in the first quarter. 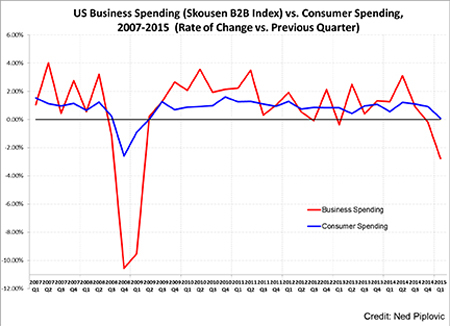 According to the new Skousen B2B Index, business spending fell 2.8% to $22.7 billion in nominal terms compared to the 4th quarter. (No B2B price deflator is available at this time, but real B2B is likely to be down slightly for the 1st quarter.) Meanwhile, consumer spending remained stable. See the chart below. Skousen champions Gross Output as a more comprehensive measure of economic activity. “GDP leaves out a big part of the economy, business to business transactions in the production of intermediate inputs,” he notes. Skousen first introduced Gross Output as a macroeconomic tool in his work The Structure of Production (New York University Press, 1990, new third edition forthcoming in August, 2015). Now the BEA publishes GO on a quarterly basis in its “GDP by Industry” data, the first aggregate statistic to be published on a quarterly basis since GDP was introduced in the 1940s. “Gross Output and GDP are complementary aspects of the economy, but GO does a better job of measuring total economic activity and demonstrates that business spending is more significant than consumer spending,” he says. According to the Skousen B2B (business to business) Index, total business spending throughout the production process fell slightly to $22.7 trillion in the 1st quarter 2015, compared to personal consumption expenditures of $12.1 trillion (no change from the previous quarter). 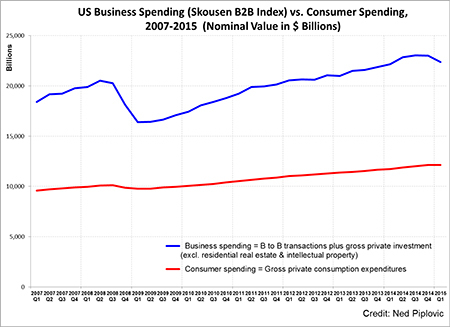 “Thus, we see that business spending is almost twice the size of consumer spending in the US economy,” concludes Skousen. To interview Dr. Mark Skousen on this press release, contact him at mskousen@chapman.edu, or Valerie Durham, Media Relations, 410-570-0535, or email her at vdurham@skousenpub.com. Thanks for this. Wish our Congressmen and Senators would read it.